Bob Grant photo. The smoke can be seen from many locations around the South Cariboo. Bob Grant photo. “Smoke concentrations will vary widely as winds, fire behaviour and temperatures change,” says IHA. Jul. 8, 2017 9:30 a.m. Residents in communities across Interior Health are being warned that smoke conditions and local air quality can change due to the unpredictable nature of this weekend’s fires. Some individuals may be more sensitive to the effects of smoke from forest fires, such as those with heart or lung conditions. These individuals should watch for any change in symptoms that may be due to smoke exposure. If any symptoms are noted, affected individuals should take steps to reduce their exposure to smoke and if necessary see their physician or local walk-in clinic. People with severe symptoms should present themselves to the nearest Emergency Department. 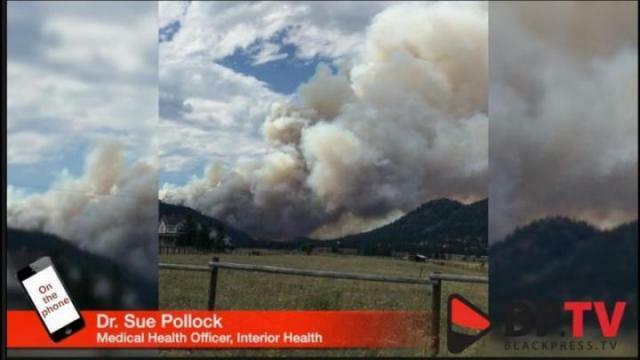 Dr. Sue Pollock, Medical Health Officer with Interior Health provided tips and information on the smoke advisory which you can listen to below. Smoke levels may be lower indoors, however levels of smoke particles will still be increased. If you stay indoors, be aware of your symptoms. Consider visiting a location like a shopping mall with cooler filtered air. Keep in mind that staying indoors may help you stay cool and provide some relief from the smoke. However, many air conditioning systems do not filter the air or improve indoor air quality. For general information about smoke and your health, contact HealthLink BC available toll free, 24 hours a day, 7 days a week at 8-1-1. With dozens of large destructive fires burning throughout the region, a Smoky Skies Advisory for Cariboo, Thompson, Shuswap, Okanagan, Similkameen, Fraser Canyon and Nicola region. The Ministry of Environment, in collaboration with the Interior Health Authority, issued the advisory Saturday morning. Conditions like these are dangerous for people with heart of lung conditions and everyone should take extra caution. For tips on how to handle living in smoky conditions, read the IHA document below. Send us your best news tips, photos and video to us by clicking the Contact tab at the top of the page.